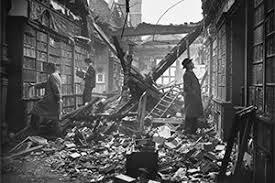 A group of us were holed up in the basement of a Victorian hotel trying to stay safe from the bombs as they fell. You could hear them outside, the thud of a bomb dropped from the belly of an airplane, followed by the rat a tat tat of machine gun fire near enough to make you avoid the walls, for fear of a penetration of bullets through the walls and into your body, or other people’s bodies. This gunfire was persistent like the buzzing of a mosquito over your face, only you could not swat this sniper out of existence. You could only cover you head with your arms, lie as close to the centre of the basement as possible, and hope. You watched bodies as they fell around, saw others sprawled out inert, dead or near dead. The unlucky ones. And you with a small group of others decided it might be safer to go up the stairs along the heavy wooded balconies up countless flights of stairs, across the thick Axminster runners with their brass ends fixed to keep the carpet steady. You could not keep your heart steady as you pulled your tired body up step after step in line with a few others who like you could not lie still in the basement hoping not to die, but unable to do a thing about it. You clung to the inside bannister of the staircase and hunched over to avoid any bullets that might penetrate these walls. Again the sound of bombs dropping nearby and then the lull of reprieve and the hope this time the bombs might stop for good only to have the start up again thirty minutes later in a pattern of fracturing explosion followed by an eerie silence and muffled only by the sirens on the street below and the occasional wail of a person somewhere in the building who could not take it any more. The air was thick with the diesel smell of low lying planes, the smell of burning buildings and you imagine the smell of human flesh as if someone was having a barbeque only they were cooking plastic and chemicals instead of nourishing food. You were not one bit hungry, too scared for hunger as you watched a gnarled dark skinned woman take a gold chain from her neck. The chain studded with a spiritual icon, St Christopher perhaps or the Virgin Mary, and you watched her slip her precious chain through a small gap in the window frame so that it rested there between the window and the fly screen, for safekeeping perhaps, or as a memento for those who might come after. And in the morning, when dawn began and the planes flew away, you crawled through the building and up to the top floor and on your way you found other precious items left behind by other people desperate to discard their most precious belongings in some vague hope of safe keeping. On the top floor you realised you were no longer on land but now in a huge plane cruising over the city but this plane had a hole in its fusillade and you could see air coming through and felt the momentum of the plane going down like a deflated balloon and you hoped only for a safe landing.